Alexander, C.A. “The Evolution of Public Medical Care in Baltimore City.” Maryland State Medical Journal 1967 Jun. ; 16 (6): 60-67. Banks, Amanda Carson. Birth Chairs, Midwives and Medicine University Press of Mississippi, 1999. Carroll, Douglas. “A Botanist’s Visit to Baltimore in 1835” Maryland State Medical Journal 1974 Apr. ; 23 (4): 49-55. Carroll, Douglas. “Yellow Fever Epidemics of the Late Eighteenth Century in Baltimore.”Maryland State Medical Journal 1972 Sep.; 21 (9): 47-52. Cordell, Eugene Fauntleroy, “The Medical Schools of Baltimore.” Transactions of the Medical and Chirurgical Faculty of the State of Maryland, Baltimore, 1881, 320-356. Downey, J.W., Jr. “Otology in Maryland and Baltimore through 1925.” Maryland State Medical Journal 1976 Nov.; 25 (11): 59-63. Fee, E. “Sin vs. Science: Veneral Disease in Baltimore in the Twentieth Century” J Hist Med Allied Sci. 1988 Apr. ; 43 (2): 1451-64. Flexner, Abraham. Medical Education in the United States and Canada, New York, 1910. Gevitz, Norman, ed. Other Healers: Unorthodox Medicine in America. Baltimore: Johns Hopkins University Press, 1988. Gevitz, Norman and Barabara Barzansky, eds. Beyond Flexner: Medical Education in the Twentieth Century Greenwood Publishing Group, 1992. Gordon, J. “Public Health and the Conquest of Disease in Baltimore, 1792-1968.” Maryland State Medical Journal 1969 May; 18 (5): 95-97. Harvey, Abner McGehee. The Association of American Physicians 1886-1986: A Century of Progress in Medical Science. Baltimore: Waverly Press, 1986. Harvey, Abner McGehee. Science at the Bedside: The Development of Clinical Investigation in the United States. Baltimore: Johns Hopkins University Press, 1981. Kaltreider, D.F. “History of Contraception in Baltimore.” Maryland Medical Journal 1987 Jul. ; 36 (7): 597-601. Kerson, T.S. “Almshouse to Municipal Hospital: The Baltimore Experience.” Bulletin of the History of Medicine 1981 Summer; 55 (2): 203-20. Lancaster, K. “On the Drama of Dying in Early Nineteenth Century Baltimore.” Maryland Historical Magazine 1986; 81 (2): 103-16. Lancaster, R.K. “Green Mount: The Introduction of the Rural Cemetery into Baltimore.” Maryland Historical Magazine 1979; 74(1): 62-79. Means, James Howard. The Association of American Physicians: Its First Seventy-Five Years. New York: Blakiston Division, McGraw-Hill, . Miles, L.H. “Summary of Obstetrical Service in Baltimore from the late 1880s to 1926.” Maryland State Medical Journal 1975 Oct.; 24 (10): 46-49. Nelson, Sioban. Say Little, Do Much : Nurses, Nuns, and Hospitals in the Nineteenth Century (Studies in Health, Illness, and Caregiving) University of Pennsylvania Press, 2001. Reimer, Terry. 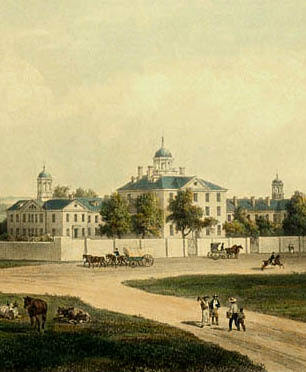 One Vast Hospital: The Civil War Hospital Sites in Frederick, Maryland after Antietam(Frederick: National Museum of Civil War Medicine, 2001. Ritchey, D. “The Baltimore Theatre and the Yellow Fever Epidemic.” Maryland Historical Magazine1972; 67 (3): 298-301. Rosenberg, Charles E. The Cholera Years: The United States in 1832, 1849, and 1886University of Chicago Press, 1987. Sewell, Jane Eliot. Medicine in Maryland: the Practice and the Profession, 1799-1999.Baltimore: Johns Hopkins University Press, 1999. Spiegel, A.D. “The Role of a Physician in the Composition of the Star Spangled Banner.” Journal of Community Health 1995 Aug; 20 (4): 367-78. Stickle, D.F. “Death and Class in Baltimore: The Yellow Fever Epidemic of 1800.” Maryland Historical Magazine 1979; 74 (3): 282-299. Vicchio, S.J. “Baltimore Burial Practices, Mortuary Art and Notions of Grief and Bereavement, 1780-1900.” Maryland Historical Magazine 1986; 81 (2): 134-48. Woodward, T.E. “Yellow Fever: From Colonial Philadelphia and Baltimore to the Mid-Twentieth Century.” Henry E. Sigerist Supplemental Bulletin of the History of Medicine 1980; (4): 115-38.